2015 Workman/Ayer, Viognier “Abroachment” Lodi, California. 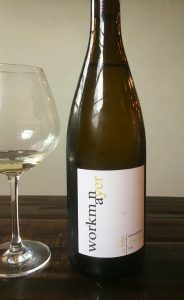 The crisp, but ripe 100% Viognier “Abroachment” by Workman/Ayer comes from a really exceptional vineyard site and was crafted using only stainless steel and it was all non malo-lactic allowing for a less thick and sweet version of this aromatic grape. With a little age now, this 112 case production Viognier is showing it’s full potential and is in its prime drinking window with nice maturity showing and a pretty texture. Led by Michel Ayer, who oversees the winemaking, continues to impress with this boutique micro winery, the Workman family, his partners, have a long and broad history in the northern California wine business, while the Ayer family has deep roots in agriculture both in Iowa and in California. These two families have come together to produce small lots of Rhone inspired wines from some California’s finest vineyards, mostly in the Santa Barbara area, but a few from old vines in Lodi under their Workman/Ayer label. Not a shy wine at all, time has allowed things to evolve nicely allowing loads of honeysuckle and apricot jelly to shine through along with hints of orange, peach and melon fruits as well as fig, clove and dried ginger notes. The 2015 Abroachment is a Viognier that fans of this grape in California will adore with plenty of up front perfume and fruit, it is not going to take you Condrieu, but it’s pretty fun!